Every time you take your car in to a dealership for a repair or even a minor service, you get a receipt. Over 20 years, those receipts can pile up into a thick wad that you may be tempted to throw away. Don’t. Keep those receipts forever, especially if you plan to sell that vehicle at some point. 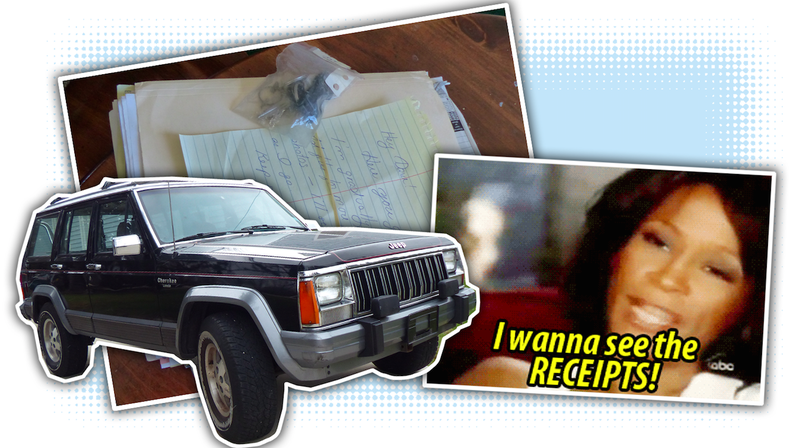 My 1991 Jeep Cherokee’s incredibly detailed receipts are a great example why. A couple of months ago, I went through hell to get my hands on a 1991 Jeep Cherokee. It was a manual with vent windows, and it had very little rust, so I would have done almost anything to take ownership of that rare machine. I ended up dropping $2,000 on the vehicle at a buy here-pay here used car dealership in Indianapolis. And while that’s a lot to spend on a salvage title XJ, I just received something in the mail that made me abandon any thoughts that I got ripped off: full service records. Or at least, as close to full as I’ve ever seen. The receipts are numerous and incredibly detailed. The first thing in the envelope sent to me by the previous owner is the original dealership sticker in almost mint condition. There’s not a whole lot of practical use to it, other than that it confirms how the car should be configured, which can help if you want to restore the thing back to factory original spec like I do. But for the most part, it’s more of a novelty that, to collectors, tends to add a bit of value. But what really adds value to the vehicle are the service receipts. When you buy a used car, it may run, drive, and sound great. But it’s hard to determine how long a vehicle and its many subsystems will last based on how it appears to operate today. What you need to know is how the vehicle has been treated over the long term. And though there are some components whose health you can easily check (for example, a compression test can be a good indicator of engine health), service records are the most useful bits of information to determine how a car has been cared for over time. Plus, they can help you out when diagnosing a fault. Knowing when certain components were replaced is a godsend. Fill the rear diff with new fluid and install a new pinion seal. Throw on a new rear driveshaft u-joint. Install a new muffler and tailpipe. Speaking of steering, my power steering pump got replaced in 2009, and “bulk hose” was used for the return line. I don’t see a receipt for a clutch or for a slave cylinder (which is in the transmission bell housing). The previous owner did tell me the slave has been swapped, though, so that’s comforting, even if I’d rather see it on paper. In 2008, my 1991 Jeep Cherokee’s vents got a clean, and the valve cover gasket got replaced. I found multiple valve cover gasket replacement receipts in this stack; it’s a common problem on 4.0-liter engines. As you can tell, a number of big, high-dollar items have been replaced on this Jeep over the years. From steering boxes to power steering pumps to exhaust manifolds, this XJ has been an expensive vehicle to maintain. But hopefully, this means these big-ticket items will last for many years to come. In addition to the major items, it’s the little basic maintenance services that give me high hopes for this XJ. The previous owner took this Jeep in and got its 12,000 mile service done in late 1991. As you can see by the slope of the curve, the previous owner drove this XJ quite a bit in the early years, but as time went on, the vehicle was driven less and less. This isn’t surprising, but it is nice to see that the vehicle has not sat for any extended period of time. What’s more, I know based on the service records that the vehicle left its rust-free sanctuary of Oregon in late 2016 for the salty mess of Chicago. Based on the records, it appears that the vehicle was only driven about 10,000 miles while there, which explains why the body is in such great shape. And it puts me at ease knowing that I probably won’t find any hidden rust as I comb through the Jeep further. This plot’s real benefit, though, is pinpointing how long ago the repairs were made, since not all of the receipts have a mileage stamp on them, but nearly all have a date. Keeping receipts helps you keep track of what needs to be done to keep your car on the road. And it’s also a great way to make a vehicle more attractive to a future owner. To the next owner, the records tell the vehicle’s service history over the years—which major parts have been swapped (in my case, it was quite a few parts that commonly fail on XJs), how frequently the fluids were checked and replaced, and what sorts of accidents the car has been involved in. It helps to give an idea of what still needs to be done, taking some of the unwanted surprise out of used vehicle ownership. Plus records help with troubleshooting of future faults. Even if you can’t really rule out a part just because it’s been recently repaired, the stack of receipts still helps with the diagnostic process, much like how medical records help a doctor determine what’s wrong with someone. If a human uses records to stay healthy, then surely a car should too. Especially if that car is something as magical as a five-speed 1991 Jeep Cherokee Laredo.